What is Google's Disavow Tool? Want to know how Google’s Disavow Tool can help your website? Then read this! 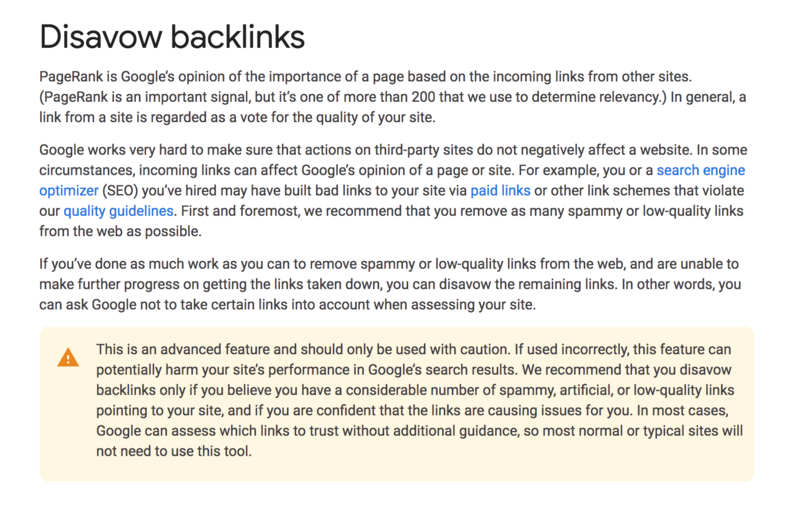 The theory behind Google’s Disavow Tool is simple; get rid of bad links from third parties which slow down your sites and push them lower down the rankings. On the surface, it seems like a golden ticket to reviving your websites and restoring your traffic. However, in reality, it’s not so easy. Remember, if something seems too good to be true, it probably is! If you have been in the online marketing world for a while and you have had some success with your sites, then by now you should be well acquainted with backlinks. However, if you’re not, then here is a quick breakdown. Backlinks are links from other websites to yours. In theory, the more links to your site the better, as it means you will have a greater number of traffic sources. However, some backlinks come from disreputable sources such as spam, and these will ultimately bring down your SEO ranking if left unchecked. When should you disavow a backlink? Google is a bit like a judgmental mother-in-law, judging the content of your character by the company you keep. If she sees you hanging around with shady looking characters, she’s going to try to make your life hell! This is because Google believes that “a link from a site is regarded as a vote for the quality of your site.” They have the power to boost your domain and page authority scores, which will then increase your visibility and rank. Does this mean you need to get rid of all of your friends just to please your mother-in-law? No, but you should definitely consider losing the ones that are of no use to you and only ever talk to you when they need money. Then it’s time to make some money. Register with Converting Team today and we’ll show you how. Or click the share button below to spread the word. Personality Types Matter in Marketing: Which One are You?